Mizzou protest and the shifting of NCAA scholarship rules. The Mizzou football player protest would have been unthinkable just a few years ago. But this NCAA rule change made it possible. Drew Lock, No. 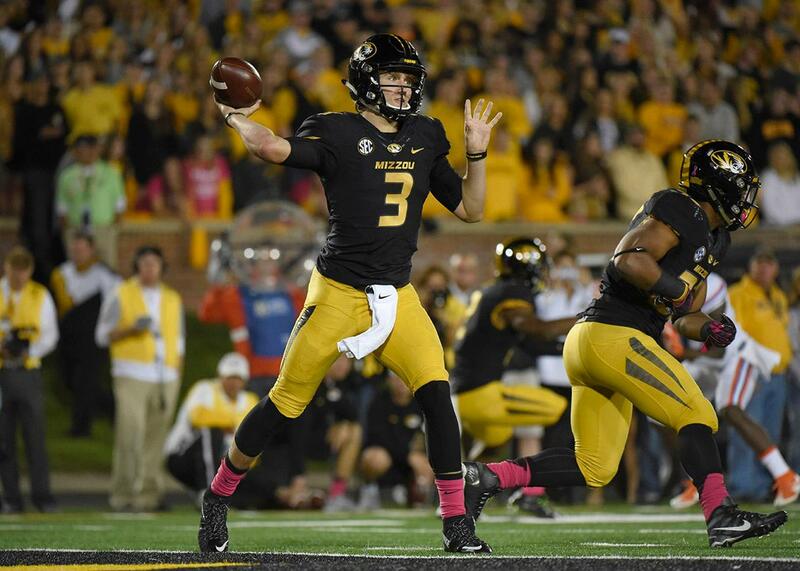 3, of the Missouri Tigers drops back for a pass against the Florida Gators in the second quarter at Memorial Stadium on Oct. 10, 2015 in Columbia, Missouri. Tim Wolfe was forced to resign as the president of the University of Missouri on Monday thanks to the school’s football players. Expressing solidarity with a campus movement already in progress, these unpaid college athletes had threatened not to play until Wolfe was out of office, citing the university’s inadequate response to a series of incidents of racism on campus. So he, and also the school’s chancellor, stepped down. As recently as a few years ago, such collective action would have been unthinkable. But since 2012, a small but important shift in how the NCAA treats its free labor force has occurred. When the Mizzou football players began their protest, many wondered if they might have their scholarships revoked. In a piece calling the players “lazy cowards,” the conservative site RedState noted approvingly that University of Alabama coach “Nick Saban would already have [had] all thirty players scholarships revoked just on principle.” Crucially, though, rather than dangling this threat, the University of Missouri’s football coach Gary Pinkel backed his players, and together they forced the administration’s hand and may have set a precedent that will be hard to break going forward. It used to be that college athletes could lose their scholarships for pretty much any reason: if they were injured, if the school claimed they were injured when they weren’t, if they didn’t play up to the coach’s standards, or for whatever excuse the team might come up with to free up a valuable scholarship spot. Earlier this year, a former Delaware State University volleyball player sued her old school, alleging that she lost her scholarship for opposing her coach’s mandated church attendance and Bible study policies. In another case from last year, Georgia Bulldogs football coach Mark Richt admitted to dropping a recruit because he didn’t like the player’s Twitter account (Penn State did the same thing the previous season). The first college athlete in the country to stage a Black Lives Matter protest, Knox College’s Ariyana Smith, was suspended from her team indefinitely for the display, which involved lying on the court for 4½ minutes as a reminder that Michael Brown’s body was left out in the street after he was killed in Ferguson. (Smith has said she believes the college only overturned her suspension after a media uproar, and she did not immediately return to the team.) These cases show how dangerous it was until very recently for players to exercise their free speech rights: Say or do the wrong thing, you just might lose your scholarship. “For most of these guys, I think they fear retribution from their institutions if they do speak up,” Robert Bennett III, a staffer at Ohio State University’s office of diversity and inclusion, told the publication Diverse: Issues In Higher Education last year. But in 2012, the NCAA began instituting a series of small-bore reforms in response to legal challenges that have shifted the scholarship dynamic, starting with the allowance of four-year scholarships after nearly four decades of forbidding them. Between 1973 and 2012, college athletes had to reapply every year for their scholarships, which might not be renewed on the slimmest of pretexts. Now, four-year scholarships are allowed though still not mandatory. Many major programs (including Missouri) have only offered them to a small number of college athletes. But the fact that even a small number of college athletes get the four-year deal must allow for a certain confidence that wasn’t there before. But this is even bigger: At the start of 2015, the NCAA’s five most prominent conferences—including Missouri’s conference, the SEC—passed a reform package that has further reduced the ability of athletic departments to retaliate against college athletes. The move eliminated the morally indefensible policy that allowed colleges to revoke or choose not to renew scholarships for athletic reasons—such as injury or poor play. In the past, those athletic performance reasons could be used as a pretext to spike a scholarship when an athlete got out of line, perhaps by, say, threatening not to play unless a university president resigned. “[The rule change] limits the capacity of the administration to use ‘substandard’ athletic performance as a pretext for restraints on student speech and whistleblower retaliation,” Delaware Law School associate professor Andre L. Smith told me in an email. It ultimately “encourages student athletes to use their considerable prominence to engage in public discourse over serious issues.” Under the new SEC guidelines, schools could still “cancel or not renew a student-athlete’s athletics aid if he or she does not meet institutional and/or team policies,” which could have conceivably been used against protesting Missouri players had the school so desired. But, as others have pointed out, doing so would have required conceding that the “student athletes” are actually employees working for their scholarships, which would have been a public relations and potentially legal debacle. In the past, teams could have waited until the season was over to surreptitiously not renew a scholarship of a troublemaker because of his or her “subpar” athletic performance. But this threat is now gone. In the future, players seeking professional careers could still face retaliation for Missouri-style protests, in the form of reduced playing time and lost connections to pro networks. But thanks in large part to Missouri’s embrace of collective action for the right cause at the right moment, threats to scholarships are likely off the table for future college athletes who work together to express their First Amendment rights.